The husband-and-wife tandem of Dingdong Avanzado and Jessa Zaragoza mark their return in the recording scene through their respective new albums. Jessa launched her latest album, Jessa Sings The Great Musical Icons, last October 10 at Eastwood Mall in Libis, Quezon City. Dingdong's comeback album, on the other hand, is reportedly entering its final stages of production. Dingdong Avanzado played the role of a supportive husband last Saturday, October 10, at the launching of his wife Jessa Zaragoza's new album held at Eastwood Mall in Libis, Quezon City. Titled Jessa Sings the Great Musical Icons, the singer dubbed as the Phenomenal Diva—brought mainly by the massive success of her Filipino "jukebox" hits in the past like "Bakit Pa? "—dished out nine songs from the album while Dingdong patiently took pictures and videos of the event from the front row before settling on the left side of the stage leading to the finale. Dingdong's involvement in his wife's latest project dates back to the actual recording where he served as one of the producers along with Elmer Blancaflor, Brian Cua, and Jimmy Antiporda. The 13-track all-revival album is Jessa's comeback album after six years of inactivity in the recording business. Jessa's last record, Kahit Na Ilang Umaga, was released in 2003 under Star Records before she and Dingdong decided to settle in the United States. Recording and production for the new album were done intermittently depending on Jessa's availability. After months and months of irregular studio time, Jessa decided to spend more time here in the country to finally wrap things up. "'Pag umuuwi ako sa Philippines kahit two weeks-two weeks, nagre-record ako. Kaya lang nga, medyo nahihirapan din kasi kunwari ni-record mo 'yong isang kanta, mamaya kailangang merong i-cure na maliit lang na portion. Kaya itong year, nag-decide talaga kami ni Dingdong na mag-stay dito sa Philippines para matapos ko 'tong album," Jessa told PEP (Philippine Entertainment Portal) and other members of the press after the performance. NO MORE POLITICS FOR DINGDONG? Jessa is equally supportive of her husband's upcoming comeback album, promoting it in advance by describing it as: "Naku, ibang klase!" For the said project, Dingdong mentioned working overtime to produce an album composed of original materials touching on the concept of love and even topical subjects. "Excited din ako kasi I went back to writing songs and lately, 'yong mga nangyayari sa bansa natin, masyado akong naapektuhan, hindi lang outwardly pero inwardly, so I was inspired to write more songs. So through this, hopefully, mailalabas ko lahat ng inspiration na 'yon," said Dingdong. Some of the songs personally penned by Dingdong include "Ang Akala Ko," "'Di Pa Huli," "Kung Maibabalik," "Maghihintay Sa 'Yo," "Ngayong Pasko," and the classic OPM hit, "Paalam Na." 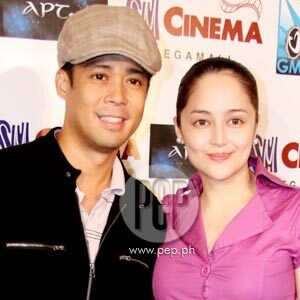 Jessa's excitement when it comes to Dingdong's return in the music scene, however, doesn't extend to her husband's possible re-entry into the political arena. "Magpapaka-totoo ako, ayoko," Jessa offered with all honesty. "Kasi ang hirap. Pero sabi ko nga, kahit gaano kahirap 'yon kung talagang gusto talaga ng asawa ko at malins naman ang intensyon niya, susuportahan ko siya... 'Yong pagmamahal, kasama dun 'yong hirap, e."
Dingdong, who assumed a political post in Quezon City some years back, acknowledged being courted by some quarters to give politics another shot in time for the 2010 national elections. He revealed: "Hindi maipagkakaila na ang daming nagtatanong sa akin. Ang dami ding nagtutulak sa akin to pursue it. Ako naman, as long as the desire to serve is there, why not? Pero right now, I'm really weighing my options. I'm not closing my doors. It's just a question of kung kailan tsaka 'yong right timing." Nothing is still certain at this point and Dingdong fully understands Jessa's concern should he decide to run for public office anew. "Mahirap and it's really a commitment. Talagang full-time 'yan and minsan talagang mauuna pa 'yan kesa sa pamilya mo, so malaking desisyon 'yan," he concurred in closing.